Digital Light Processing uses a projector, like the kind used for office presentations or in home theaters, to project the image of the cross section of an object into a vat of photopolymer (light reactive plastic). The light selectively hardens only the area specified in that image. The most recently printed layer is then repositioned to leave room for unhardened photopolymer to fill the newly created space between the print and the projector. Repeating this process builds up the object one layer at a time. DLP is known for its high resolution, typically able to reach a layer thicknesses of under 30 microns, a fraction of a sheet of copy paper. 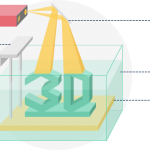 Like Stereolithography (SLA), objects printed using DLP are known to have less visible layers than are visible with other techniques, such as Fused Deposition Modeling (FDM), at the same resolution. DLP printers can produce objects with a wide variety of properties such as water resistance, flexibility, durability, stiffness, high clarity, thermal resistance and high impact resistance. The photopolymers have been designed to mimic ABS, polypropylene, and wax, making them useful for everything from high quality prototyping to lost wax casting. However, prints using photopolymer can become brittle with increased exposure to light over time. They may begin to show small cracks and become more susceptible to breaking. With this process, only one material can be used at a time because the object is built out of a vat containing a singular photopolymer solution.